Descended from a long line of ninja, Jiro Azuma can also talk to animals, and his rough and tumble appearance belies his compassionate nature. He meets Rago, a mysterious, unique, and suspicious, stray black cat. Jiro's compassion for animals will get him into trouble, when his encounter with Rago rudely introduces him to the world of the mononoke and changes his life forever. As Black Torch, Vol. 3 (Chapter 8 to 11) opens, Jiro and Rago face a giant mononoke during their training drill. In a trip into Rago distance past, the duo will also meet the menacing and suave mononoke, Amagi. Then, Jiro, Reiji Kirihara, and Ichika Kishimojin head to Hirasaka City after it is enveloped in a mysterious fog. Waiting in the fog is danger... and Rago's past. THE LOWDOWN: The Black Torch manga, with its creatures of myth, is tailor-made for me. I love me some ninja, and I desires me some supernatural creatures from Japanese myth, folklore, and fairy tales. I can only get that in a manga. 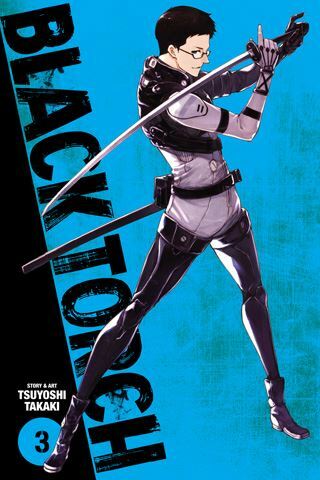 POSSIBLE AUDIENCE: Fans of ninja and of supernatural Japanese creatures will want to read by the light of the Shonen Jump title, Black Torch.